I think most people want to be happy; they are just not quite sure how to get there from their present location. Many people honestly believe that happiness is a lucky bounce; a sunny disposition or favorable circumstances but I disagree. Happiness is a choice. I believe the best route to happiness is found by following the footsteps of those who have already arrived. Here are my observations on the topic that have been formed by watching happy people for decades. Focus on what you have and not on what you don’t Unhappy people are unthankful people. The practice of counting your blessings is a great start. Get out a legal pad and write down all the good things in your life. Often unhappiness sneaks in when we lose sight of all the good things in our life and become focused on one or two difficult things. Question the sources of your expectations Most unhappy people want things they don’t have…and they want them bad. Are these expectations realistic? Who is selling them to you? I hope not the media. Having a miserable existence because you are not living into a pipe dream, is really tragic. Be Generous Study after study has come to the same conclusion. Selfish people are miserable. Happy people give of their time and resources to a cause greater than themselves. Remember happiness is not a destination The happiest people I know are those least conscious of their own happiness. Happiness is learning to enjoy the ride, not reaching your destination. If you don’t like your life, change it Take control of your own life. Do want to learn to play the piano? Take lessons! Do you regret not getting a college degree? Get one. Do you want to improve your spiritual life? Start going to church. There is really no one holding you back but you. Slow down You just can’t smell the roses at a full sprint! If you, like me, are a workaholic type, build time into your Outlook to do nothing. Get a hobby. Enjoy your friends and family. Happy people have learned how to occasionally chill. Realize there are no shortcuts If you were honestly disappointed you didn’t win the billion dollar Power Ball, you are not getting it. Getting your education, working hard, putting in the hours, pursuing your dreams, saving and giving are always in style. Stop feeling entitled No one owes you anything. Just assume you are not going to get any help, that you will receive no inheritance and that no one is going to give you a break. Now go make your life happen! If anything else comes (and it probably will), it is all bonus! Think significance Significance is achieved by leaving the world better than you found it. People who feel their lives really matter are the happiest people of all! Forgive Forgiving those who have hurt you, breaks their power over you. Forgiving yourself for your failures, frees you for future success. Ask God to forgive you. Ask those you have hurt to forgive you. Make restitution where you can. Move on. A great attitude is a choice, not a disposition We can control our feelings or we can be controlled by them. Happy people CHOOSE to have great attitudes. Speak life When you speak, choose words that uplift, encourage and bring positive energy into every situation. My mom was right, “If you don’t have something nice to say, you shouldn’t say anything at all.” People who speak life are like human air fresheners. As you begin a new week, you have an opportunity to invest in your own happiness or to make yourself miserable. If you choose the former, you will make others happy as well. If you choose the latter…well, you know. -Rev. Shane L. Bishop is the Sr. Pastor of Christ Church in Fairview Heights, Illinois and the author of the new book “Love God. 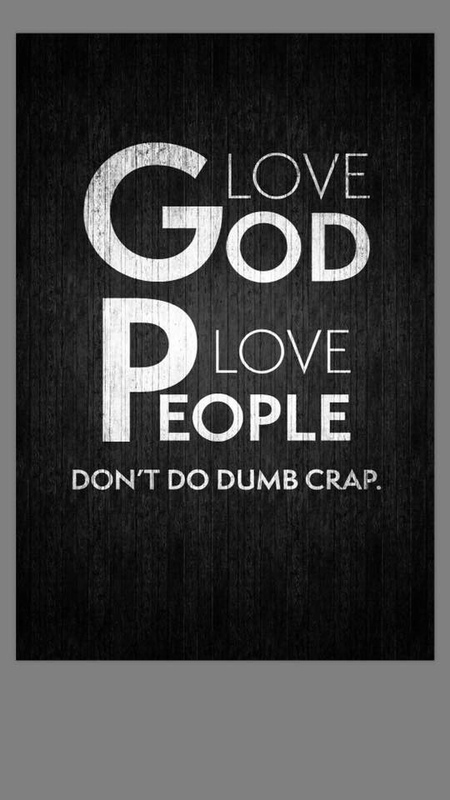 Love People. Don’t Do Dumb Crap.” available on Amazon and Kindle. We also sing a lot. Reverend, you have spoken to my heart and soul. I have been a glass half full kind of person my whole life. People often describe me as optimistic which I really hope I am. I plan to reread your post to keep me on my chosen path. Thank you. Working hard at this every single day!! I agree with everything you said, sir. I’m not religious but a Humanist and care for people. Appreciation for life and what you have (whatever that is) counts for much. Happiness comes with love and friendship, and if it doesn’t, something is wrong somewhere! “The practice of counting your blessings is a great start.” It truly is. You don’t have to count them all at once, notice a few each day. Suddenly the world is brighter. I list Gratitudes many days on Facebook. I started as a way to remind myself to be thankful. Surprisingly I have had many people tell me that they look forward to seeing them. This is awesome! Very well put! I, for one, will share this article! Thank you! Well put. And factual. Share for others to learn and gain. Thanks ! Thanks form the Monday morning uplift!!!!! Published in the late spring, this one is nearing 2.9 million views. Thank you for the words or encouragement ! Love your thoughts…hate the hat. Go Cubbies!